“Please excuse the mess, but we actually live here”. This is what I say now when people pop over to my messy house – actually it’s just my house. It’s always messy. And finally, finally, I’ve accepted that. So, I’ve stopped cleaning up for other people – and it’s seriously the most liberating thing I’ve done in a long time. Once upon a time my hubby and I lived in a less messy home. I won’t say mess-free because neither of us are neat freaks, but you could definitely walk from room to room without having to step over toy trucks and dinosaurs. Back then the kitchen bench was also clear for preparing food, and not a dumping ground for kindy artworks and the like. Our bathroom never smelt of wee, because that’s just gross. And our couch always had artistically placed scatter cushions – these days it’s lucky to have any. But now we have kids. Yes my kids rummage through the toy box on a daily basis and only clean up their mess when I get all snarky with them and yes my eldest is still perfecting his toilet aim, so I’m forever wiping up his little ‘spills’, but their messy nature isn’t the only reason I’ve relaxed about people seeing our home the way we live in it. It’s because I’ve stopped pretending. This wasn’t a conscious decision, I admit. I didn’t have some grand epiphany that I’d feel better about my life if I stopped pretending I’m on top of it. It just happened. I host a weekly mother’s group playgroup. It’s just a casual, drop in if you can/want to on a Monday. Some weeks everyone is there with their littlies and it’s a lunch box snack party, and other weeks just one person and her cute kidlet rocks up. For weeks though, I used Monday playgroup as a ‘crap, I need to get the house in order’ deadline. 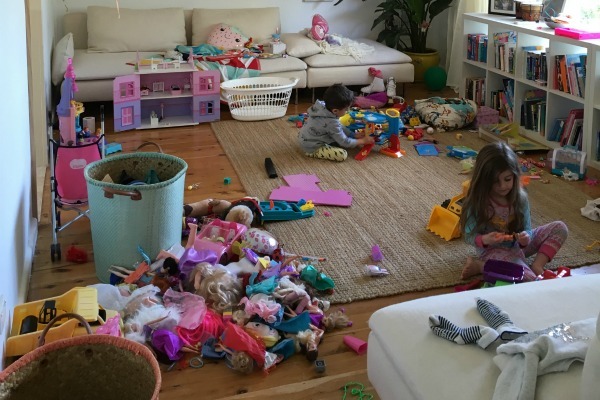 On Sunday afternoon, instead of relaxing with my family, I’d frantically vacuum, clean the bathroom, sweep the floors, declutter EVERY eff-ing room and tidy the toys (just so they could migrate all over the house again as soon as one child arrived). But one week I couldn’t do it anymore. We’d had such a busy weekend and by Sunday night I was trying to finish some paid work when the kids went to bed. My cleaning time was gone. Life had gotten in the way and I couldn’t pretend anymore that this doesn’t happen most of the time. So when Monday rolled around, I thought about cancelling on my friends. I was so embarrassed about the state of my house and then it hit me. My friends won’t care. They are tired mums just like me. They’ll understand and more importantly, they, like me, need this. The truth is, us modern mums have it pretty tough. We mother, work and try bloody hard to keep everything in order and also everyone happy as chips. We are tired. Stressed and stretched. So I didn’t bother cleaning up or even hiding the washing basket that Monday and you know what, no one cared. In fact, it made them relax about the state of their homes, too and the fact they aren’t on top of it all either. I know this because when I visit them now, I can visibly see they haven’t cleaned up for me. And it makes me smile. It makes me feel great about the fact they are so comfortable with me to be honest about their messy lives, and also because they know I understand their struggle. I haven’t stopped cleaning, but I have stopped cleaning up just for other people. 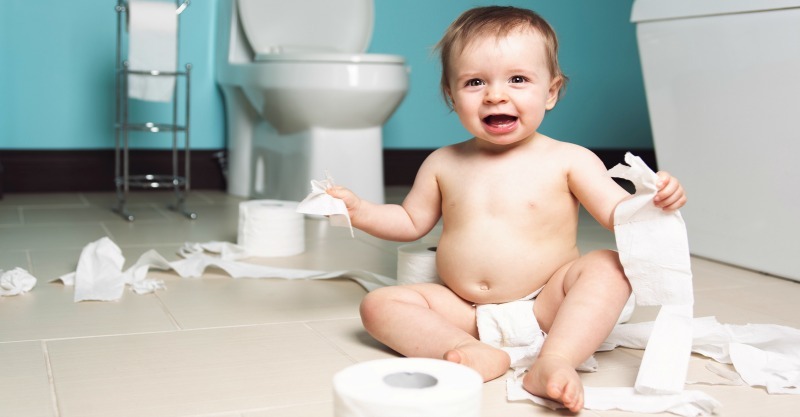 Nowadays when I get my family to clean the house with me, I do it for me, because the mess has gotten to me and also because I know how important it is to teach my boys not to be slobs. I don’t want their future wives to resent me! 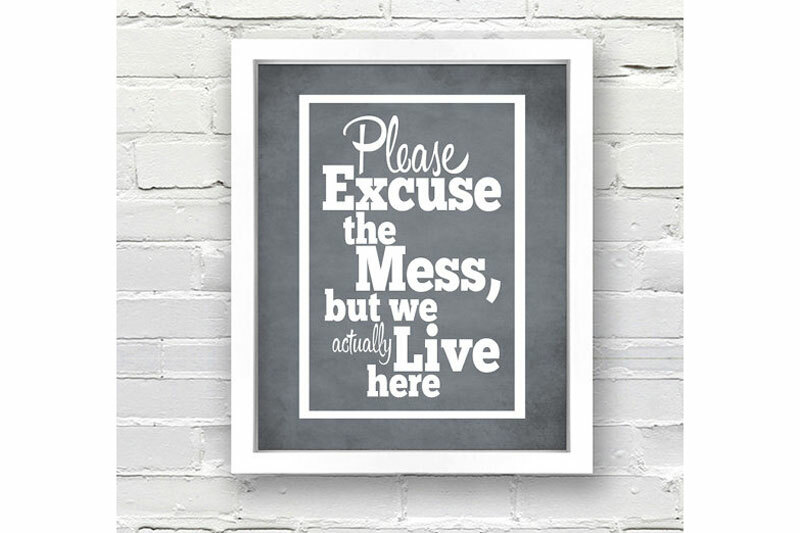 So I think I am going to buy this cute sign from ETSY and hang it in my messy home. It will serve as reminder for me to be honest about my life and relax about it. Everyone with kids will love it.